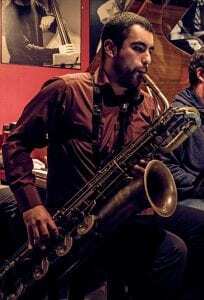 Marcos Contreras is a Chilean Saxophonist who graduated with the highest honors in Classical Studies at The University of Chile in Santiago. His Classical teacher was Miguel Villafruela and he specialized in Jazz Studies with Professor Claudio Rubio. He has also achieved studies in Pedagogy in The Musical Arts at The University of Chile in Santiago. In 2010, he won a national competition of Young Soloists in Chile, participating as a soloist with the Symphony Orchestra of Chile. He studied a postgraduate degree in Composition and Jazz music arrangements at The Projazz Institute of Music in Santiago of Chile, specializing in the 4 saxophones (soprano, alto, tenor and baritone). In Classical Music, he participated in the most prominent symphony orchestras in Chile, as a soloist and extra musician in works by Ravel, Gershwin among others. In Jazz Music, he has participated in the most prominent national Big Bands such as; Los Andes Big Band, Quintessence ensemble, NODO Ensemble and the Reko Big Band. In Chamber Music, he has participated in leading projects such as; Chilean Saxophone Quartet (Bari Saxophone), Ukrolim duo Saxophone and Piano, and other projects of contemporary music. In Jazz Music, Marcos has had personal projects such as; Jazz Quartet, Emanon Jazz Quintet, Duo Saxophone and Guitar among others. He has received 3 state prizes in Chile in tours across the country. He has participated in discographies such as; Kalimarimba, Los Andes Big Band, Ensemble Nodo, Chilean Saxophone Quartet, Camila Moreno Group, Artist Cannonball Saxophones among many others. Nowadays, Marcos Contreras teaches music in the ARCIS University of Arts in Santiago of Chile and also in The Academy of Music of the City County of Puente Alto. In addition to this, he is an outstanding session musician in advertising and television projects.